Yay for my first pumpkin recipe of the season! And this is totally the perfect way to start your Monday off right. 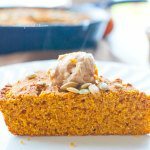 Actually, eating this pumpkin cornbread for breakfast every morning will ensure that you’ll have the most fabulous week of your life! Although, if you’re a cornbread loving pumpkinaholic like me, then you’ll be lucky if this pan makes it to the end of the dang day. So, yeah, go ahead and make a couple of pans while you’re at it because…gingerbread butter, y’all. You’ll want to slather this butter on every thang. I’ve eaten so much of it within the last 48 hours I should’ve just gone ahead and smeared it on my thighs with a butter knife. Eating it was way more fun though. And the pumpkin cornbread? It goes great with so many meals! I just made a batch of my honey pecan chicken and it was incredible, and I bet it would also go well with my sweet potato gnocchi too. Or you could just shovel the slices in by the fistful and eat the gingerbread butter right off of the spoon. I’m sorta committing blasphemy at the moment b/c sweet cornbread is just not how I was raised and, honestly, I don’t even really like it. Mama Mac would probably take one bite, frown, then push her plate away if she wasn’t forewarned that it was mildly sweet. I totally get that too. Sweet cornbread is more like cornbread cake, and when I want cornbread? 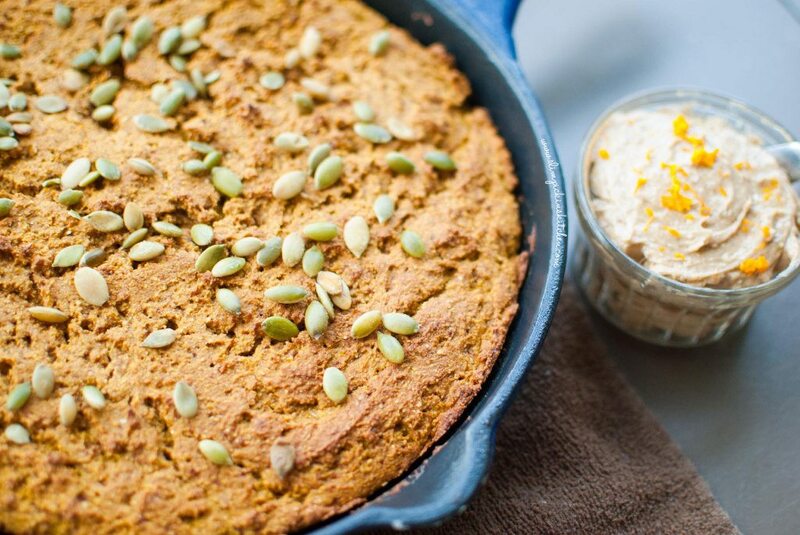 I want savory cornbread that I can crumble on salads or dip into hot and spicy soup. Sugary cakey cornbread just doesn’t fly with me…unless it has pumpkin in it, apparently. I’ve become a colossal lover of coconut sugar lately b/c it is molassasy and brown sugary, and you can use it in place of granulated sugar. From what I’ve heard it has added health benefits and nutrients which just makes it that much better. 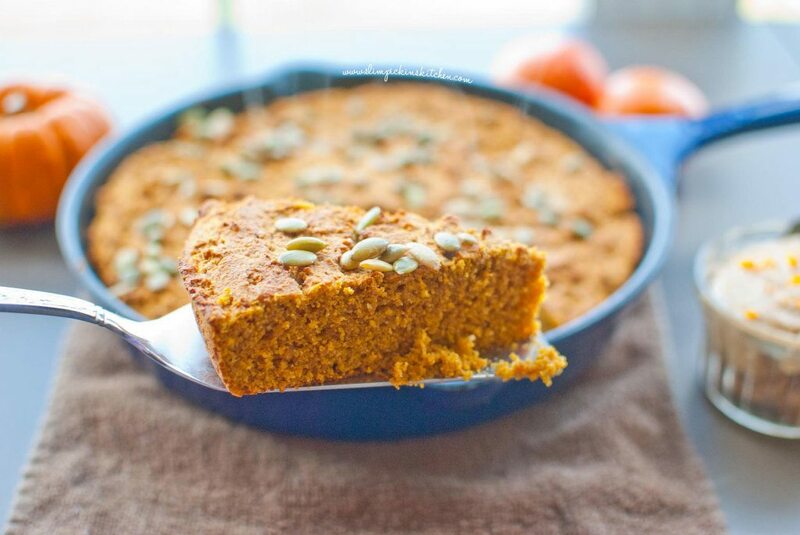 The coconut sugar in this cornbread gives it a rich, subtle sweetness without overpowering the pumpkin which, clearly, is the star of the show. Oh, wait. No it’s not. The gingerbread butter definitely takes that award. Whipped and compound butters are one of my favorite spreads, and I eat them on all kinds of things. Just call me Paula Deen! But really though, this gingerbread butter just melts in your mouth and melts so beautifully over the cornbread. I groaned with delight when I first tasted it, and my head almost exploded when I tasted it on the cornbread. 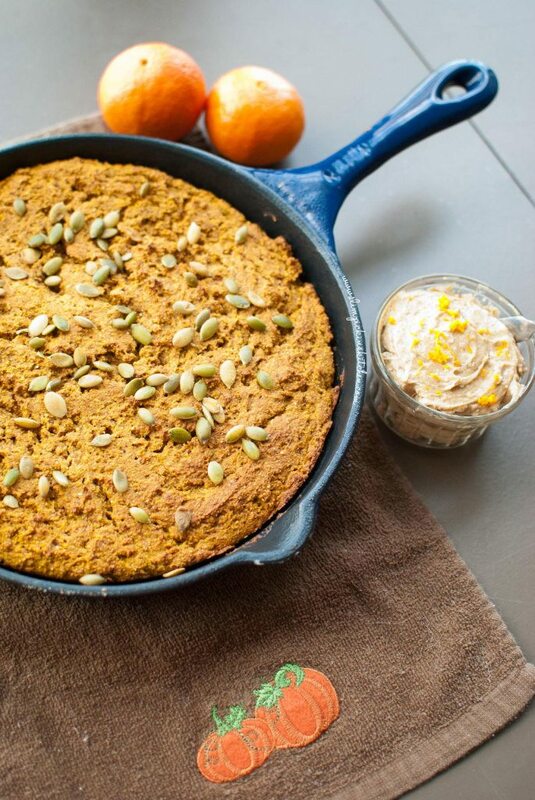 Gingerbread butter + pumpkin cornbread is a match made in fatty foodie heaven. Preheat oven to 400 degrees (F) and spritz a cast iron skillet w/ non-stick spray. Set aside. In a large bowl, whisk together corn meal, flour, baking powder, salt, pumpkin pie spice, and coconut sugar. In a separate bowl, whisk eggs, pumpkin, & cooled coconut oil together until well mixed. Add wet into dry and stir until the dough just comes together. Pour batter into the skillet and bake for 20-25 minutes. Serve warm slathered w/ the whipped gingerbread butter. Add all of the ingredients to the bowl of a stand mixer (or use a hand mixer) and whip until fluffy & well mixed. 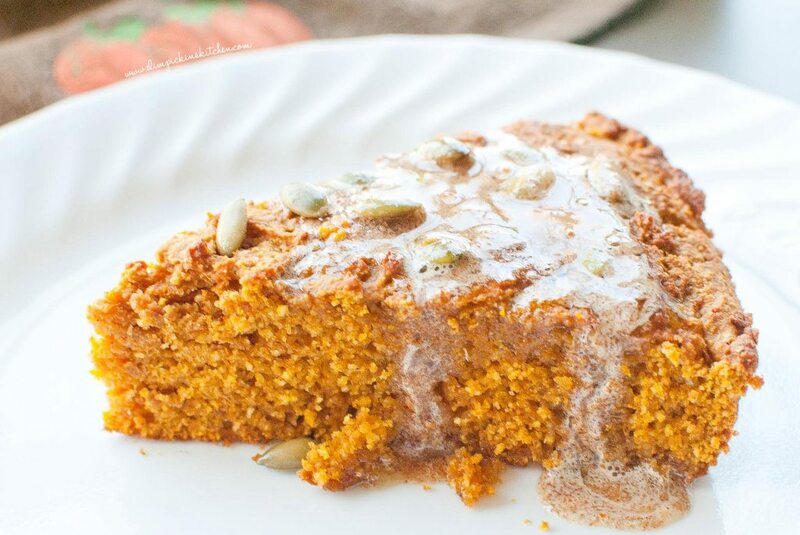 Serve on warm pumpkin cornbread. 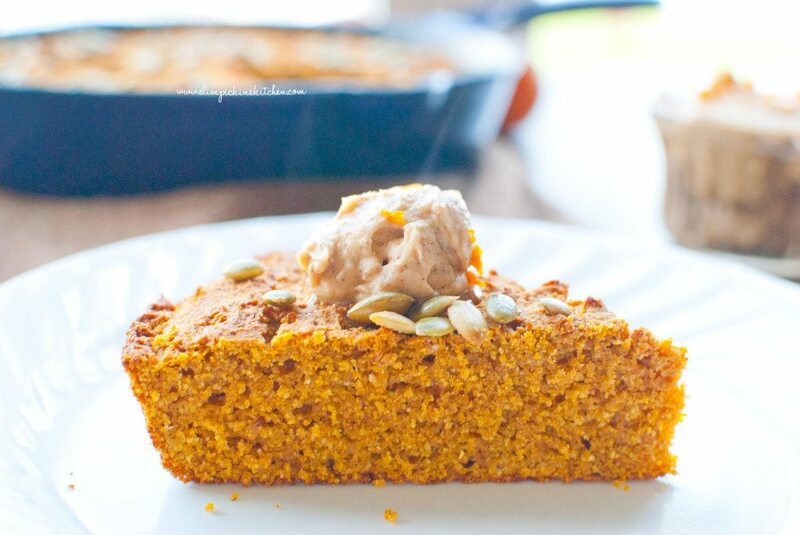 Can’t decide what I love more about this, the pumpkin cornbread or that amazing looking gingerbread butter! Genius! I have never made cornbread before, let alone pumpkin cornbread! This looks SO delicious and I think I could devour a bowlful of that whipped gingerbread butter by itself too. Thalia, whaaaaaat?!? You must make cornbread this instant! And, yes, I almost devoured the gingerbread butter by itself. It’s amazing!